And one of them happens to be India’s favourite son Sachin Tendulkar, owner of virtually all batting records worth owning but still not a match-winner in Shoaib’s book. Never far from controversy in his playing days, Shoaib Akhtar has kicked up quite a storm in India with his autobiography “Controversially Yours”, questioning the integrity of most players he came across. Also, the “Rawalpindi Express” claims Tendulkar, at one stage, was mortally scared of his raw pace. Much to his delight, the Indian media seem to have swallowed the bait. They have reacted with baffled fury, wondering how the erratic speedster can point an accusing finger at someone like Tendulkar, whose integrity remains beyond doubt even after two decades in international cricket. Cricket is often called religion in an otherwise secular India and Tendulkar is its presiding deity. Even the local media treat him like the sacred cow, completely untouchable. With his harsh views of statistically the greatest batsman ever, Shoaib has clearly touched a raw nerve in India. Probably this is what Shoaib, and his publishers, intended to achieve. After such a tumultuous release, they would be surprised if the copies of the book do not fly off shelves across India. It does not take an expert to tell us that much of the vitriol in Shoaib’s autobiography “Controversially Yours” is adulterated. In fact, it’s more marketing than malice. In this interview to CNN-IBN, Shoaib does a U-turn as spectacular as his albatross-like celebration after taking a wicket. “…he is the greatest among all of them. World cricket needs to be thankful to Sachin Tendulkar… Cricket needs to be thankful to great Sachin to have played this game,” Shoaib says. There seems a method in it. Australian Adam Gilchrist tried something similar in his 2008 autobiography “True Colours”. Gilchrist questioned Tendulkar’s integrity in the “Monkeygate” affair, prompting many Indians to order a copy of the book before he called the Indian cricketer to clarify the comments. Pakistan’s most controversial cricketer Shoaib Akhtar invited a little more drama on the eve of his book launch, tearing into Indian greats Sachin Tendulkar and Rahul Dravid while also taking shots at former national captain Wasim Akram and even the country’s former president Pervez Musharraf and admitting ball tempering. In the book titled “Controversially Yours” Shoaib claimed that his career was hampered by legendary Pakistani pacer Wasim Akram. “Wasim Akram threatened to walk out with half the team if I was included in the team. General Tauqir Zia (the then PCB chief) backed Shoaib against Wasim,” he wrote of fissures previously unheard of. "....Vivian Richards, Ricky Ponting, Brian Lara and the likes of them are great batsmen who dominated with the bat and were truly match-winners. Initially, when I bowled against Sachin, I found these qualities missing. He might have had more runs and records, he lacked the ability to finish the game," he said in the book. Shoaib, who announced his retirement during the World Cup this year, also cited an example where he felt that Sachin was mighty scared to face him. "I bowled (Sachin) a particularly fast ball which he, to my amazement didn't even touch. He walked away! That was the first time, I saw him walk away from me-- that, too, on the slow track at Faisalabad. It got my hunting instincts up and in the next match I hit him on the head and he couldn't score after that", Shoaib wrote. Shoaib who played for Shah Rukh Khan co-owned Kolkata Knight Riders during IPL has accused the Bollywood superstar and former IPL commissioner Lalit Modi of "cheating." "Shahrukh and I talked about my not being happy with the money settled on me. Shahrukh and Modi got me to agree. I should have never listened to Modi and Shahrukh," he said in the book. Shoaib also spoke at length about politics in Pakistan Cricket Board. He didn't shy away from taking a dig at Shoaib Malik. He didn't stop short of calling Malik a "stooge of PCB chairman Naseem Ashraf" and that's why he was made the captain. “Shoaib Malik doesn’t deserve to be captain and was made captain because he was a stooge of the PCB Chief Naseem Ashraf,” states Shoaib. Akhtar, who was twice suspended by ICC for ball tampering during his career, defends the speed merchants for indulging in this illegal cricketing activity. In his tell-all book, Akhtar cited examples of how he had indulged in doctoring the ball during his playing career. "I have tampered with the ball on many occasions. Have been warned several times and even being caught twice - Dambulla was one such instance. I was suspended for a match and fined 75 per cent of the match fees," he said in the book. But Akhtar also confessed that it had slowly become a habit. "I can't seem to help it. I have got to do something with the ball. I know this will make a big noise but I won't lie about it." Not only about his own antics but Akhtar also revealed the secret of an unnamed Pakistan cricketer who actually changed a ball in order to get more reverse swing going. "I won't name him but one Pakistani cricketer actually switched the ball in the umpires' pocket with one that reversed like crazy. Umpires usually keep the ball in their coat pockets and then hang their coat up for lunch. That was when the transfer occurred. After this incident, they now leave their coats in a locked room." The autobiography has met its title as Shoaib Akhtar has criticized some former Indian cricketers as batsmen Dravid Rahul and Sachin Tendulkar. Earlier the autobiography was launched in New Delhi and the ceremony was attended by Pakistan High Commissioner to India Shahid Malik. During the ceremony the former right-arm fast bowler, Shoaib Akhtar said that the people must read his first autobiography “understand his words” on Rahul Dravid and Sachin Tendulkar, adding that they are Players of world class cricket. Tyson is expected to visit India between October and December to shoot for the fifth season, which airs in October, reports a daily. This time the show is going to be really big as Salman Khan and Sanjay Dutt both are the hosts of the show. South African fast bowler Wayne Parnell has converted to Islam after a period of personal study and reflection and will celebrate his 22nd birthday on Friday as a Muslim. Parnell confirmed in a statement on Thursday that he converted to Islamic faith in January this year and is considering to change his name to Waleed, which means 'Newborn Son'. "While I have not yet decided on an Islamic name I have considered the name Waleed which means Newborn Son, but for now my name remains Wayne Dillon Parnell. I will continue to respect the team's endorsement of alcoholic beverages. I am playing cricket in Sussex and this is my immediate focus," said Port Elizabeth-born Parnell. "As I am approaching my first period of fasting, I ask that this special time is treated with respect. I am a young man, a professional cricketer by trade, and while I can appreciate and am grateful for the public interest in my personal life, my faith choice is a matter which I would like to keep private," said the promising Warriors left-arm seam bowler. Proteas team manager Mohamed Moosajee, himself a Muslim, said Parnell's Muslim teammates Hashim Amla and Imran Tahir had not influenced his decision to convert from Christianity. "Wayne already decided a few months ago to follow Islam," Moosajee said of the cricketer, who excelled during the ICC World Cup on the subcontinent. "The decision to convert was his own decision, but I know nothing of the name change," added Moosajee. Fellow players, preferring to remain anonymous, said they believed Parnell was very serious about his choice of religion and that he had not touched a drop of alcohol, forbidden to Muslims, since the recent Indian Premier League series. Supporting Moosajee's denial of influence by Amla, the players said he had never attempted to convert them to his religion, although they had all been very impressed by the discipline and strict adherence that Amla showed to his religion, by refusing to participate in celebrations with them that involved liquor, staying steadfast in his daily prayers even while on tour, and refusing to wear the kit sponsored by South African beer brand Castle Lager. In his first two years after making his debut for the Proteas in 2009, Parnell developed a hard-living reputation. In October 2009, he was kicked out of the provincial side Warriors following an incident in a night club in the city of Port Elizabeth in the early hours of the morning. He came to limelight when he captained South African Under-19 team in the U-19 World Cup in 2008. He was the youngest player to get a central contract in 2009 at the age of 20 years. He is the second Christian to have reverted to Islam after Pakistan's Yousuf Yohana (now Mohammad Yousuf) in 2006.
so-called ‘spiritual powers’. After a massive protest by every sector of society yusuf kazzab was arrested and after a trial of more than 2 years it was proved in court that he claimed not only as a prophet but also as second return of Muhammad SAW naoozbillah. According to reports of those days ( in 1997) published in different national daily and weekly newspapers, yusuf kazzab deputed zaid zaman hamid as his 1st Khalifa before his arrest and Zaid Zaman Hamid was following his case in court also. Audio tapes, news reports, eye witnesses, personal diary and letters of Kazzab confirmed the allegations on Kazzab and he was sentenced to death by high court but during his appeal in Supreme court he was killed in jail by other prisoner. Ziad Zaman’s letter to the editor of Daily DAWN was published on 13 august 2000 and in which he said the court’s decision as “murder of justice”. Zaid Hamid disappeared soon after kazzab was killed and he appeared after 9-10 years in 2007-08 on TV as zaid Hamid (his father was a retired Army col. Zaman Hamid. His full name is Syed zaid zaman, (hamid is his father’s 2nd name). All the news reports of kazzab were later compiled as a book " Fitna Yusuf kazzab" which was published in 1997 ( 12 years ago and Zaid hamid was not famous at that time) and his name is mentioned in this book more then 20 times with yusuf kazzab. Below actual pages of this book are provided which clearly mention zaid zaman hamid’s relation with yusuf kazzab. Note:- Arshad Qurashi, the Auther of the book “Fitna yusuf Kazzab” has dead in 2003( May Allah bless him Jannah). His brother Ansar Iqbal is owner of Muaarif Publishers Lahore and he confirmed that this book was published in 1997 by his brother. Why his past is necessary to discuss and disclose? When ever zaid hamid is asked for his contacts with kazzab he always saying it a ‘ Zionist’s and kuffar’s blame game to stop his ‘mission’. In this research his actual reply and a detailed analysis of his reply is also included. If he were to say that in the past he was following yousuf kazzab and now he got Tauba from Allah and again became a Muslim then there was no need to criticize him on his past. But he refuses his relation with kazzab and all allegations and can not present any single evidences against all these solid evidences which are now part of the history and can not be ignored. If he cannot clear his position, It means he is still following kazzab and his belief is suspected and he has some suspected goals behind getting the trust of Pakistani nation by exploiting their love to the country and islam. He is “cashing” the hate of the nation toward Israel and India by using his strong speaking power and now he is forwarding towards next step to continue a movement like “Wake Up Lahore”. type slogans and program. He had also started his programs and lectures in colleges and universities of different cities. If a person having a sound and clear background were to start such thing then it was necessary to help him for every Pakistani, but if such person whose past is dangerous he can inject poison in the youth coating it as sugar any time. Why News Papers reported him as an active follower of yousuf Kazzab in 1996-97? 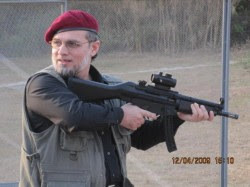 It is notable that zaid hamid was working as manager in a security company Brink’s, After this he established his own security company Brasstacks and then converted it into a so-called think tank. Zaid Hamid also delivered a speech in this audio. They claim that voice is different from Zaid hamid but these are reasons of a slighter change in voice. 1- This was recorded 12 year ago and in this long period voice of every person gets a slighter change. 2- We have listened zaid hamid every time in an emotional and aggressive style but in video he is speaking in a slow tone to praise yusuf kazab. 3- If this tape is made “now” to involve him then why this audio tape and its containing words were published in newspapers in 1997? ( below is given that report of newspaper ( book’s page no 94-95) which contains 100% same words of this audio tape. 4- Keep in mind that this audio was presented in court against kazzab if it was fake then why it was needed to “involve” zaid hamid 12 years ago? If you are his regular listener you can recognize his voice and style even after 12 years. You may be confused that mobile number of yusuf kazzab’s wife given in above page is a Telenor number of 0342 code but telenor started it services in Pakistan in 2005 so how is it possible that a phone of 0342 code was working in 1997? Actually in 1997, PAKTEL had its code for Islamabad 0351 and for Lahore 0342 (they assigned these codes on PTCL city codes of Islamabad 051 and for Lahore 042 adding digit 3 with them. So kazzab’s wife was using a Paktel number with Paktel Lahore code of 0342. The above two reports are from two different Pakistani news papers Weekly TAKBEER and Daily Khabrain reported in may, 1997.This is very clear that the 1st khalifa of kazzab named zaid zaman was a commando and he was also well known because of his Afghan Jihad participation. And we clearly know that Zaid Hamid have these qualities as he proudly accepts that he fought Afghan jihad. How Zaid Hamid can reject and say this is a blame game to destroy his “mission”? 3:- Yousaf kazzab introduced zaid zaman as his SAHABI. 4- Zaid zaman also contacted some consulates of foreign countries to seek help for kazzab.Book “ Fitna yousaf kazzab page no 306 “daily khabrain 15 May 1997 ( Page 306 is available above) and page no 302 daily khabrain 6 may 1997. 5- zaid zaman deputed his security company and guards to protect Kazzab’s home and his wife during his court trial. Book “ Fitna yousaf kazzab page no 314 “reported by dialy khabrain 23 may 1997. 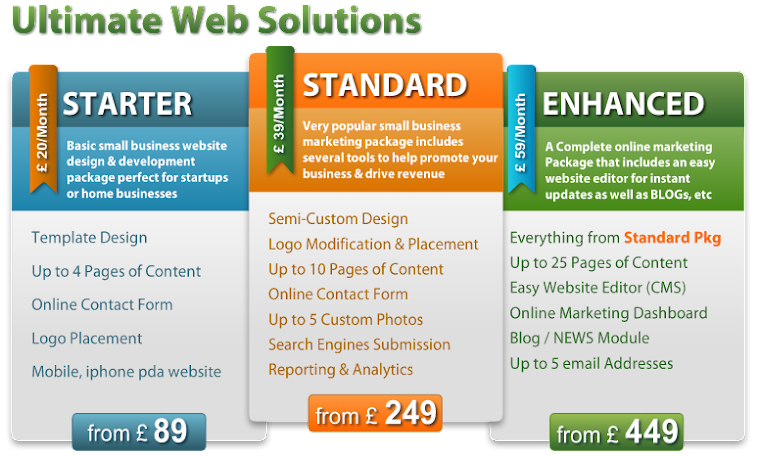 (Page 314 is available above ) and Page number 76 below. 8- Yousaf kazzab deputed zaid zaman as his representative for Pak army ( bcoz zaid hamid is son of Retired army col. Zaman Hamid ?) Book “ Fitna yousaf kazzab page no 44 “reported by weekly Takbeer 30 march-05 April 1997. His name as an active follower and 1st Khalifa of Kazab was also mentioned in local and national media and khabrain, Ummat, nawa e waqt. weekly takbeer, jassarat and other newspapers reported him, this is also mentioned in this book with relative dates. These facts shows clearly that ZAID ZAMAN HAMID links with YOSUF KAZZAB and now he want to establish Khilafah of Yousuf Kazzab. Please read all post and take decision in the light of Quran and Sunah. I moved to USA about 17 years back and hence was relatively out of touch with the developments in Pakistan. Therefore it was not only abysmal but rather surprising to see Zaid Zaman now Zaid Hamid (I am not sure what is he up to or why did he change his name) portrayed as a scholar, a defense analyst, a nationalist and may be someone who can lead our nation in the future. I think the last time I met Zaid was when he attended my wedding ceremony along with few other of his very close friends. All of his associates who attended the ceremony were the followers of a “Peer” named Yusuf. There I came to know that Zaid was not only the devotee but in essence one of the top followers of this “Peer” Mr. Yusuf, an ex army officer with quite a bit of following among youngsters. Later I came to know that this Peer was arrested as he claimed himself to be a prophet. I met Zaid Zaman first when we went for a debate competition arranged by Pakistan Airforce in Risalpur representing Adamjee Science College. I do not want to comment much about my first impression but it was of course not very pleasant and positive. Then onwards being a debater, I visited Zaid’s academic institution the NED University frequently for different Students Union Programs. At that point Afghan jihad had a great impact on the lives of Pakistani nation. I remember all this not because it was too obvious, but in essence was too weird to too creepy to see Zaid portraying himself as a fighter in a battle field or may be dramatizing his actions as much as if he was acting in a movie scene. Hence I always felt that Zaid had some kind of mental instability. And now being a physician in USA for 17 years, we call some one demonstrating these symptoms as a Bipolar with Manic Disorder type, where one thinks himself as a redeemer, a savior and some one who possess grandiose personality. What made me write this letter is not that I have any thing against Zaid Zaman, but since he could be another leader in the making in Pakistan, hence I felt it to be my responsibility and obligation to let people know about him. This is the least I could do to my beloved homeland. Pakistani nation has already been deceived and betrayed repeatedly by their leaders in the past. It breaks my heart to see they end up making another disastrous mistake. And once again become victim of prevarication and fiddling. Mr. Zaid Zaman is a devotee of a liar, follower of a claimer of false prophecy and an unstable person. My dear friends this is the age of technology and multimedia resources, like a true believer do not get bitten by the same hole twice. Take your time and use all the possible resources before you start delegating some one as your leader!! Now of course it is up to every individual to decide what do they want to do!! More than 50 % (1st Half) of his above reply is completely irrelevant from the topic and he is asking a lot of questions instead of giving answers of above mentioned questions. Zaid Hamid did not reply that why Pakistani media was reporting his name repeatedly as biggest follower of kazzab in 1996-97? Were Pakistani News papers following any CIA propaganda against a “ future scholar “? Keep in mind that at time zaid zaman hamid was not famous as today, so why new papers were “harming his image”? and if we assume that audio tape was made as a scientific trick then why high court Lahore accepted it as an evidence in the trial and what about continuous reports against him in news papers of that time? Due to yusuf kazzab, khatam-e-nabuwat is not disturbed. It means that believer of yusuf kazzab (as 2nd return of Muhammad SAW) can claim that he still believes in khatam-e-nabuwat. If some body blames you that you believe in Kazzab as prophet then what will be your rational reaction? You will immediately reply that “Curse of Allah on the yusuf kazzab and his followers”. Zaid Hamid never never said that curse of Allah on “yousaf kazzab” and his followers. Why? If he were to curse on yusuf kazzab directly then it was more convincing and after this all allegations on him become ineffective but he never said “curse on yusuf Kazzab”. in any of his videos while replying on allegations he never said the word “ yousaf kazzab”….why?? Did any body heard the word “yousaf kazzab” from his mouth? Even he never said his name “yousuf” during the explanation because he knows that if he says “yousuf “ then it will be necessary to say “kazzab” ( which means the biggest liar ) with his name as all Muslims say with the name of every false prophet. Here is an example and see how zaid hamid by passes the original question put by a student in his recent program in Superior University Lahore at 5 jan 2010. Ziad Hamid is demanding repeatedly sharia proof for the allegations on him but when did he provide any sharia proof when he blamed Senior Journalist Hamid Mir as CIA Agent in a live TV show? Ziad Hamid is blaming so many politicians in his almost every show (we know they are not innocent ) but sharia proof is still needed before allegations as Zaid Hamid needs in his own case. But he could not present even a single paper as a proof in his any program. Zaid Hamid’s TV shows are sponsored? There is another allegation on him that his tv shows are sponsored by some hidden resources and he pays tv channels to get his shows on air. It means that his shows are just like paid documentaries. 1- Zaid hamid started his TV shows on TV1 channel with the name of his company brasstracks which is a security services provider company owned by him in islam abad. Did you ever have seen any tv show whose name is based on a company name? How TV channels allowed him to advertise his own company name as the name of program in a show which is “not sponsored”? His TV shows are recorded in brasstracks offices and then they are on aired after paying the on air time to the TV channels. TV channels are not showing their secret agreements to the public and it is a little hard to prove it but if we just analyze the situation we can reach to the story behind the scene. Zaid Hamid ( The hero of ‘revival of khilafat and sharia’ only changes the fashionable girls and his suits in these programs) This issue will be discussed later why zaid hamid and his team is using girls & boys close interaction to attract youth while having a motto of revival of khilafat and sharia. 2- Why TV channels are not giving enough time to General (R) Hameed Gul and Imran Khan who are speaking on national interest against India and USA from more than ten years? Do they have speaking, convincing or analytical power and knowledge less then Zaid Hamid? Even last year Hameed Gul was threaten by Americans not to speak against Musharraf, Butto Murder and judges case. But he was not given enough chance to speak like zaid hamid on TV channels. why? He is not patriot or he has any blame in his career? Even Hameed Gul is more prominent hero of afghan Jihad then Zaid Hamid. 3- Did u ever scene a TV show on any TV channel like Zaid Hamid’s shows in which the hosts ( most of them are unknown and unskilled girls) are giving him just topic and he is only speaking, speaking more and more? In every political or current issue show host is also an anchor and discusses the matter with a strong participation, take views of viewers by live calls, letters or emails etc. We know so many famous political and defense analytical Tv shows Like Aaj Kamran Khan k sath, Mere Mutabiq, Bolta Pakistan, capital talk etc but Zaid hamid’s program seems as they want to give him more and more chance to speak without losing a single minute. 4- Have our TV channels become suddenly so patriot that they are giving their sale able time to a “ONE Man SHOW”.? 5- The host of zaid hamid’s show mostly saying him “Sir zaid hamid”. This is not usual in any TV show. U can watch many recorded shows of different anchors on youtube but you ll not get any host saying his scholar guest “ SIR” ?? After all above discussion, how can zaid hamid say that these programs are recorded by TV channels and TV channels are paying him? If not them who is sponsoring these long TV shows? My previous article focused on the free reign of hate speech in some Pakistani media outlets that made liberal use of a mix of unsubstantiated conspiracy theory, faulty facts, racial hatred and religious intolerance, and my perspective was formed particularly by watching Zaid Hamid who does the show "Brass Tacks." In the week since, I have found the rhetorical violence present in the 'lectures' of Zaid Hamid followed up by a close dose of how it informs the reality of Brass Tacks and Zaid Hamid. Since the article he has circulated to the members of his mail group that I have attacked him at the behest of the Zionist Banking System, the Kufr Dajjal and that their 'war' has entered a new stage. He encouraged members to write to me, and they have in force. 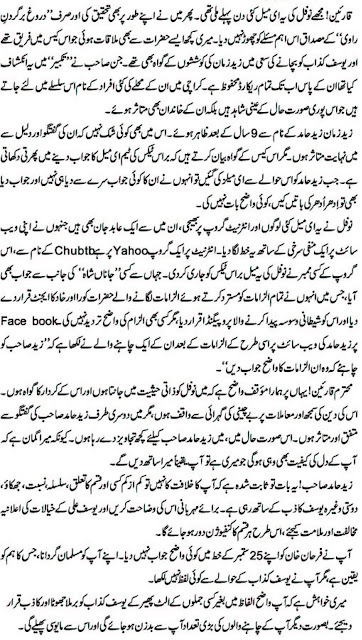 From veiled threats, to how my picture in this column looked like the dajjal (I am content with how God made me), or my membership to the 'Illuminati' amongst a number of others have all come my way, including links to documentaries on YouTube from where they have done their 'scholarly research…' Brass Tacks has a huge Islamic component, I wonder if Zaid Hamid has forgotten the lessons of 'tohmat', or allegations, and how Islam views it. While at first I thought Zaid Hamid to be well-intended but misguided, what I have now seen firsthand demonstrates delusion. In this postmodern world where people have surrendered a good deal of their intimate freedoms to impersonal institutions, where the interlinked nexus of governments and corporations creates ripples that people find difficult to understand, the conspiracy theorist takes the easy way out by assuming that all events are at the hands of a secret few. Despite the invalidity of these theses, they have staying power because they offer no proof, and hence they cannot be disproved, especially if they are the product of a paranoid imagination. Common to most of these conspiracy theories is 'de-individualization', which is lumping people into impersonal groups and taking their humanity away from them. That's what Zaid Hamid does when he rants about the inferiority of Hindus, the inherent evil nature of Jews or Pakistani leaders he disagrees with. He neglects to realize that his method is what also drove the neoconservatives in creating a world in their own ethnocentric image and in the killing fields of Iraq. This method also drove the perpetrator of the Marriott attack, who was so convinced of his mission that he didn't mind killing scores of the poorest for a few choice targets. One of the major world conspiracies happens to be that the invasions of the US were conducted at the behest of Halliburton, an energy company with known ties to individuals of the US administration. Well, the Bank of America (BOA) has just recommended the stock of Halliburton after the CFO of the energy company met with BOA officials. So by one degree of separation, isn't Brass Tacks, the company of Zaid Hamid, linked to Halliburton because of the BOA connection? Now I want to clarify that all the above facts are true, but I do not believe in the yarn I wind around them to make them connect. I do not believe for a second that Zaid Hamid intends to create fear and profit from it. He just happened to be a security expert who landed on TV with a pre-existing business and started preaching his prejudices derived from random conspiracy theories. I wrote the scenario above to illustrate how the coincidental can be woven together to make a compelling narrative that has no real truth, nor is it causal or correlated. It is thinking like this that I wish Zaid Hamid would question himself on, because as demonstrated above even he could fall prey to the world where nothing is substantiated and the dicey is used as truth to fan hatred. As far as profiting from concerns he preaches against, well that's for him to resolve. But the absolutism that Zaid Hamid holds others to, he does not hold himself to apparently. This absolutism is not just moral in his case, it is intellectual as well. In his recent programme, he described how income taxes were one of the greatest conspiracies of the US. Had he just bothered to look into the system of income taxes and public finance, he would have realized that a progressive taxation system is one of the greatest tools to redistribute wealth and to help the poor. Accidents of birth, talent and intelligence can be mitigated into a more just society when there is a documented tax base, and societies can pay for services to the economically disadvantaged. A progressive taxation system can make sure that there are good hospitals, schools, pensions and other benefits that can help them overturn an unequal society by redistributing from the rich to the poor. The welfare state that all populist Islamic leaders promise will be based on the progressive income tax system, not government sales tax (GST). If we had no income taxes, and only GST then we would be taxing consumption, and for the poor food is a large part of that, which means relative to income no income taxes and only GST; it would penalize the poor more than the rich and they would eat less. A little knowledge is a dangerous thing. For example, Zaid Hamid has been insinuating for the longest time that most of Pakistan's leaders are in the pockets of the CIA. I am sure some are. However, Zaid Hamid makes one exclusion to his thesis, General Musharraf, someone who overtly cooperated more with the US than anyone else in Pakistan's history. Now exactly how Zaid Hamid has the knowledge to make this distinction, no one knows. By continuously insisting on television the he is the only one who knows these things, he is creating the cult of personality, not that of objectivity. After all, this is a man who decries the state of representative politics, of democracy, but that does not mean he has the right to do away with it, because the only alternative in his eyes would be someone he approves of (himself? ), not who the people choose. Ghalib's verse which later became a proverb "Hain kawakib kuchh, nazar aatay hain kuchh" is true for Mr Zaid Hamid, the fiery young expert of strategic issues and Jihad who has shot to fame in a few months through a programme Brasstacks on TVone. Yes, Zaid Hamid is really IMPRESSIVE and he is taking the simple idealistic people of Pakistan, especially youth and women by storm. Had I not known him for the last 20 years, I would, too, have been all praise for this 'new' bright face on the TV talking about Zionism, Muslim conquests, Afghan Jihad, good and bad Talibans, and what not through his self-sponsored TV programme. If you guys remember the Pakistan false prophet, YUSUF ALI, who was arrested and sentenced to death by the Lahore High Court and then murdered in Kot Lakhpat jail by a fellow prisoner - this guy Zaid Hamid was known as Zaid Zaman at that time and was the Khalifah of that Kazzab. Zaid is still leading that cult which belongs to the firqah batinyah of sufism and they have a different aqeedah altogother which they only profess within their inner core. Many of my personal friends fell prey to his charisma in the 1990s, some of them reverted back to Hidayah and were instrumental in filing a case against Yusuf Ali which ultimately lead to his death sentence and the cult members dispersed for a few years. All of the followers of Yusuf Kazzab are now gathering once again in Islamabad and after 11 years Zaid Zaman has reappeared as Zaid Hamid. I first came to know about Zaid Hamid when he acted as a translator to Hekmatyar in 1989 during his visit to Karachi. I was really impressed by the bright faced young engineer from NED University who spoke excellent Persian, Pashto, Urdu and English. Later, I came to know that the training centre for Pakistani mujahideen in Posta Fez, Jalalabad was run by this man. I soon got introduced to new friends who were part of his team in Afghanistan. I even tried to run away from home in 1991 at the age of 14 to go to Afghanistan but was some how caught and persuaded by my family to refrain. In the same year I distributed several cassettes of a documentary - Qasasul Jihad - produced by Zaid Zaman, which showed live scenes of combat between Afghan mujahideen and Russian forces and was the first of its kind. For me Zaid Zaman and his team were like the re-incarnation of the heroes of Muslim medieval history. However, soon Zaid Zaman was the centre of a scandal of misappropriation of funds of a large UK-based NGO, Muslim Aid, of which he was a representative in Pakistan and Afghanistan. He also then parted ways with Hekmatyar and Haqqani and joined the ranks of Ahmed Shah Masood. Later he abandoned Jihad altogether and became a Sufi. In 1994, when I was in aitikaf in Ramazan, one of Zaman's close associates, who was also a very close friend of mine, came to meet me and started talking strangely about the "real" meanings of Islam denouncing each and every known Islamic scholar. He said that all translations and commentaries of Quran till date were blasphemous. He also said that every century has an 'Imam-e-zamana' who we should take bayah (oath of allegiance) of and he would soon arrange my meeting with that Imam. Alhamdulillah, because of my strong beliefs I never ever met that so-called Imam-e-zamana but many of my friends fell into the trap. Soon, Yusuf Ali was being invited to dinner parties in many of my friends' homes who were seen holding beads (tasbeeh) in their hands and preaching zikr and sufism here and there. I lost many of my closest friends as I felt very uneasy with their beliefs and discussions. The basis of their belief was a 'maudhu' hadith that Allah (SWT) created the noor of Muhammad (SAW) before the creation of the Universe. That 'noor' will remain till eternity and even if the Prophet (SAW) is physically not with us today, his noor is present in the 'Imam-e-zamana' and hence he should be followed as the Prophet (SAW) was by his companions. Na'aauzubillah! Meanwhile, Muhammad Tahir of Weekly Takbeer broke the news of Yusuf Ali and his cult quoting statements of some of the defectors who realized what was wrong and were ready to go to court against this fitnah. Yusuf Ali was accused of claiming to be a false prophet, immoral practices including sexual abuse of his women followers and homosexuality. Soon, a case was filed against him and the Tahaffuz Khatme Nabuwwat people also became a party. Yusuf Ali was sentence and sentenced to death based on irrefutable evidence of his misguided beliefs including the claim of false prophethood. The Tahaffuz-e-Khatm-e-Nabuwwat office at Numaish, MA Jinnah Road and journalist Muhammad Tahir still has the record of that case and clippings of related news reports containing statements of witnesses who were once part of the cult themselves. The name of Zaid Zaman Hamid also appeared in several of the news reports appearing in those days in Takbeer, Ummat, Khabrain, Jasarat, etc as he was the key promoter and khalifa of Yusuf Kazzab and the witnesses during the court proceedings and the press statements mentioned his name. According to my knowledge, Zaid Hamid is still leading that cult in Islamabad and sources close to him confirm that he still proclaims the same beliefs of Yusuf Kazzab. It is not confirmed, tough, whether the new "Imam-e-zamana" is Zaid Zaman himself or some other person. If you want to warn your friends and family from this fitnah, please spread this message to everyone you know. May Allah (SWT) guide us all to the right path. Ameen. Why Zaid never deny Yousaf Kazzab but the false prophets after Huzur (SAWW)? and How he satisfies his followers? I read his teams and his answers in details to all the queries made by people who want to know the truth and watched his all videos and came to this conclusion. What Mr. Zaid Hamid thinks of Yousaf Kazzab is that Yousaf Kazzab was a Wali Allah who loved prophet (SAWW), and he thinks that Yousaf Kazzab never said that he was a Nabi and was arrested for NO REASON. That's why he sends LANAT on all the fake prophets but doesn't mention YOUSAF KAZZAB's name because in Zaid's views Yousaf Kazzab didn't claim to be prophet. And this is how he satisfies his followers by saying every thing against those who claimed to be prophet (Nauzbilah) sparing Yousaf Kazzab. I guarantee you (the youth) that this man Zaid Hamid will never say a word against Yousaf Kazzab. He never did and he will never. In the Audio tape, his voice is clear, even after hearing his all speeches, I can identify his voice from thousand others. It’s absolutely him with Yousaf Kazzab and it’s absolutely him who tried to save him and followed him till his murder in jail. No one called Hamid Zaid “A KAAFIR”. In every speech, whenever one asks his links with Yousaf Kazzab, he gets hysteric and instead of explaining his links with Yousaf Kazzab to the audience, he starts this KAAFIR thing. The worst thing about Zaid hamid is that he is generating a ”War Hysteria among youth”, which is going to take us to no where. Islam is the religion of peace but Mr. Zaid Hamid's teachings or lectures are taking us to the urge, where there would be only one option "To Die". His recent lecture in Faisalabad makes us more clear about his plan. By Taking a Hadith, which is not authentic, he is generating a war hysteria and wants to fulfill this un-authentic Hadith i.e. Ghazwa-e-Hind. In his speech, he wanted the youth to fulfill this Hadith. Why? Even if you consider this Hadith as authentic, it’s a foreseeing. It doesn’t say that you need to fulfill it. If it’s authentic, it will be fulfilled itself. Have you ever seen a patriot muslim Pakistani, who instead of giving references from Quran and Hadith, gives references of Auliya, facebook and YouTube? See Zaid Hamid! A question to Mr. Zaid, “How many authentic Ahadeeth, are you following or fulfilling?” You followed a False prophet, you followed him to his death OR say you did not? You tried to save a person and fought for him, who claimed to be Prophet (Nauzbillah). Where was your muslimhood then? Where was your love for Islam and Prophet Muhammad (SAWW)? All of a sudden, from nowhere Mr. Zaid Hamid appears on TV with his self sponsored programs, which he had been preparing for all the ten years, he was out of scene to fulfill the prophecy of his Murshad Yousaf Kazzab. He is on Army's side because he's son of an army man and he knows how to get sympathies of army. Government is weak and destabilized already. He wants the mid-term elections like every other political party right now in Pakistan is willing to have. Till then, with his lectures and stuff, he will make a team who will take him as a leader. He dreams of becoming a president of the country with full army support and the very next step after becoming president himself or his team in govt. he dreams of attacking india to fulfill the “Ghazwa-e-Hind”. On one hand he will thus pay tribute to his beloved dead wali friend Yousaf Kazzab and on the other hand his war hysteria will be satisfied which was provoked in him in his early 20's and still is with him, proven in his speeches. Hats off to you Mr. Zaid Zaman Hamid. You chose the right thing. Its very easy for you to fool the young generation with false un-authentic sources and emotional words and phrases and once you’re succeeded, youth in your hand means the future of Pakistan to be in your hands. All the above said is my analysis of Zaid Hamid. Readers can have absolutely different opinions.